Though it may feel big at times, the island of Manhattan is still the smallest NYC borough in terms of land -- something that’s easy to remember when faced with haunting visions of holiday madness and the crowds that come with it. So, how do you keep yourself sane, especially if you don’t have the time or the means to really escape? 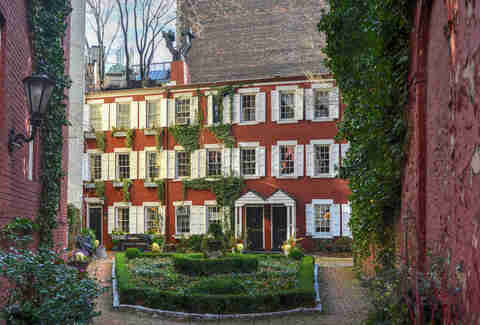 You’d be surprised to find that there are plenty of places within the constraints of Manhattan that give you a totally outside-the-city experience. From subterranean sanctuaries to an Alexander Hamilton hideout, these 10 spots throughout Manhattan offer a little urban adventure and a momentary getaway when you need it most. 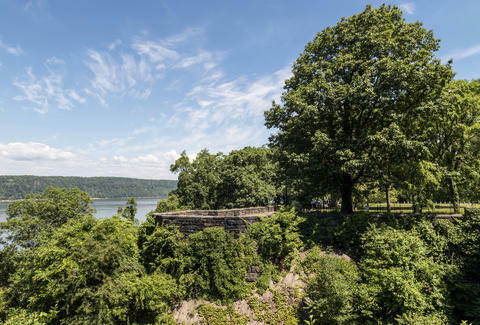 You can’t really claim to know New York until you’ve made the pilgrimage to Fort Tryon Park, the most spectacular green space in the entire city. 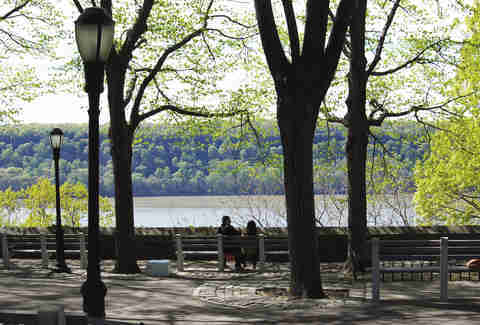 Cure your wanderlust by exploring this 67-acre haven on the Hudson: making your way through the largest public garden in five boroughs, rallying on concrete ping-pong tables, eating brunch amid the trees and twinkling lights of the veranda at New Leaf, and relaxing in the Game of Thrones grandeur of The Cloisters (home to nearly 5,000 medieval works of art and architecture). You’ve probably passed that Tudor-style building on 94th between Broadway and West End, but in your Manhattan Diner challah French toast-induced stupor, you likely never realized that it was hiding a little community of old, English-style homes. 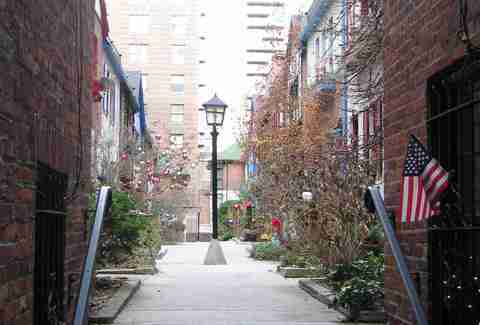 Inspired by a romantic comedy set in West London and designated as a New York City landmark in 1982, Pomander Walk is a colorful, Diagon Alley-esque enclave of 27 townhouses tucked behind a gate. If you want to get up close to this well-preserved architectural gem, you’ll have to wait for a resident to let you in (which they are known to do, especially if you ask nicely and come bearing Levain cookies). If you’re looking for enlightenment, it’s located just before the on-ramp to the Manhattan Bridge. Make your way into this Buddhist temple and prepare to come out with a sense of weightlessness -- assuming you wisely hold off eating all the best food under $5 in Chinatown until after you meditate. 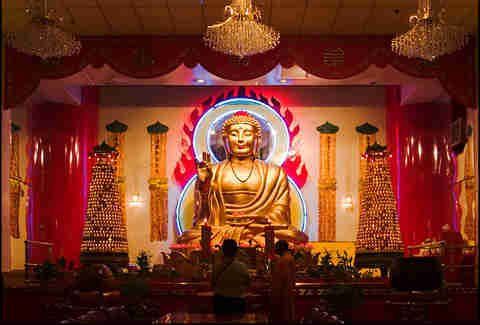 Free and open to the public, the Mahayana Temple houses the tallest Buddha statue in New York City and feels like a safe, healing space where you can just let everything go, even if you have no clue what you’re doing. 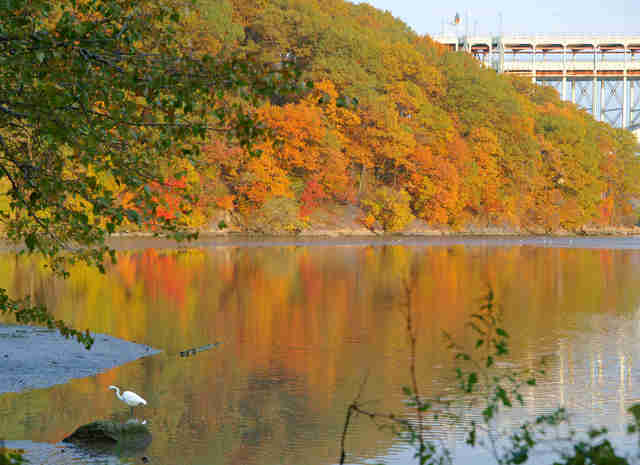 On the northern tip of Manhattan, just off the 215th St subway, is Inwood Hill Park -- a rare oasis of calm in the borough. However you choose to explore the 196 acres -- hiding out in the primordial forest, going for a trail run, reading a book on the quiet riverfront, or simply enjoying its beauty -- make sure to cap the day off with a drink at La Marina, which offers sweeping water views that’ll make you feel like there’s nothing else around but the Palisades and Hudson River. 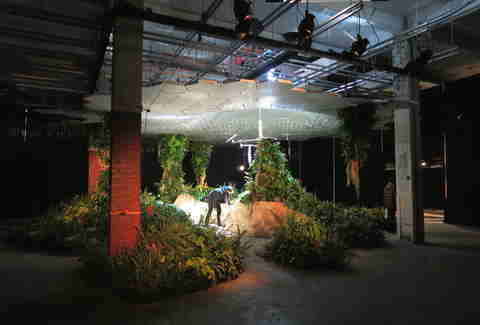 Descend below Essex for a preview of the world’s first underground park. While the Lowline’s unprecedented green space won’t be fully realized until 2021, when it opens in a 40,000sqft abandoned trolley terminal under Delancey St, on weekends you can visit the Lowline’s prototype -- a 1,000sqft atrium brimming with over 3,000 plants -- which will utilize solar technology to funnel natural sunlight underground. “My absolute favorite spot to feel like I’m completely out of the city is Aire Baths,” says fitness guru and Wellthily co-founder Suzie Baleson, who recommends going to the Tribeca spa early on a weekday to have the place to yourself. 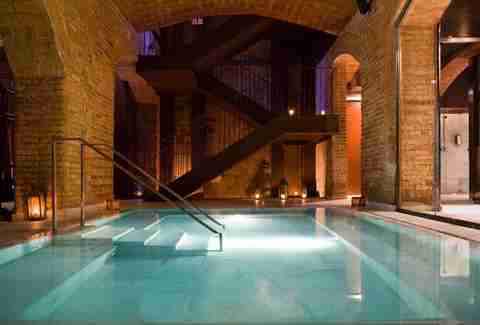 Between the flickering lights of the Marrakech lanterns, pillars of Spanish white marble, and myriad soak options (be it a saltwater pool or hot thermal bath), it’s easy to slip into a state of Zen that will actually last -- at least through the end of the day. 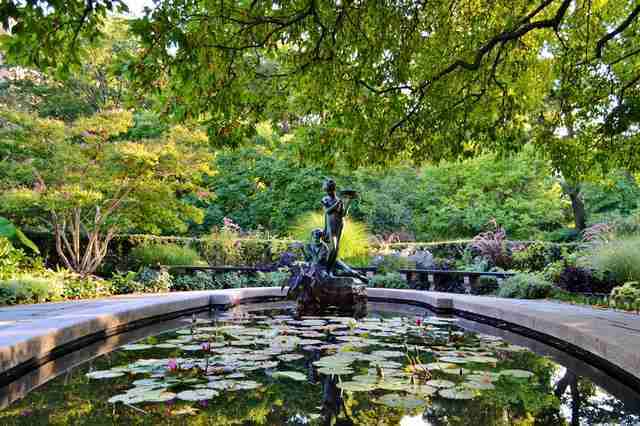 Across from the Museum of the City of New York and El Museo Del Barrio, one of Central Park’s eight officially designated Quiet Zones is a dreamy setting for book lovers, horticultural enthusiasts, and workaholics in need of a close-to-home hiatus. The six-acre formal garden showcases Italian, French, and English landscapes reminiscent of Kensington Gardens or Versailles, so expect 12ft-high jet fountains, wisteria pergola, tempting-to-pick Korean chrysanthemums, and an uncanny amount of silence. A lot has changed since 1853, when low-income housing used to look like Grove Court, an enviable hideaway of six red-brick Federal-style townhouses in a cul-de-sac between 10 and 12 Grove St. After lingering by snapping photos through the wrought-iron gate at this multi-million dollar slice of English country life in the city, go to Buvette a few doors down where you can at least afford the croque madame and pretend you’ve taken a spontaneous sojourn to Paris. The next best thing to seeing Hamilton is setting foot inside the founding father’s home. 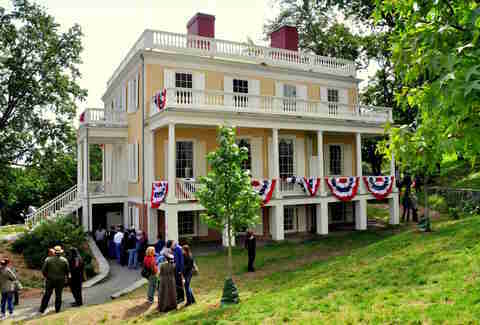 Built in the early 1800s for $17,972.06, Alexander Hamilton’s Federal-style country manor (believed to be the only house he ever owned) was originally situated on a sprawling 32-acre estate not far from where the structure sits today at 141st St in St. Nicholas Park. Before taking a step back in time with a free ranger-guided tour of the historically furnished rooms, watch the newly released Hamilton documentary with Lin-Manuel Miranda on PBS. 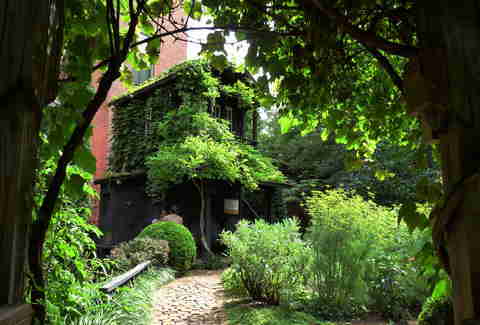 Though it's been around since the ‘80s, 6BC has remained the best kept secret garden in Manhattan. One of the more than 70 community gardens in the Alphabet City/East Village/Lower East Side area, this acre of pure botanical bliss is instantly stress-relieving as you weave along the brick pathways, ensconced in a jungle of hundreds of native and non-native plants, scarcely seeing another person, be it a weekday morning or weekend afternoon. Where else in the city -- or outside of Japan, for that matter -- can you find a waterfall, a koi pond, a solar-paneled grape arbor, rock garden, pagoda, and, oh, a treehouse? Lauren Matison is a travel writer and co-founder of offMetro.com who just saw Before the Flood and hopes you visit these places before they're under water. Follow Lauren on Instagram and Twitter.